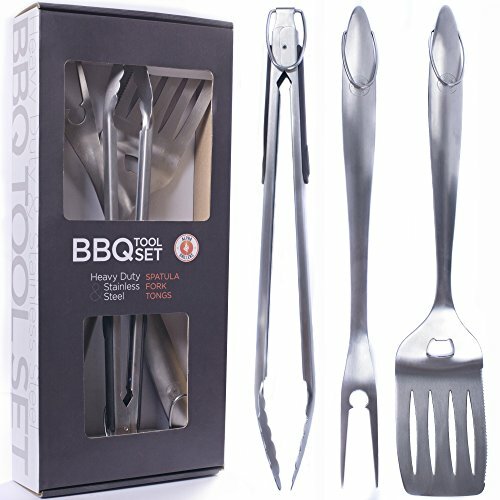 Why is this the best BBQ Tool Set for you? Quality, Durability, Design, Utility. You'll get 4 premium grade utensils built like tanks. You will never need to replace these tools. Weighing in at a crazy 2.5 pounds, that is considerably more heavy duty than most of the other 4-piece sets on the market. Why is this so important? Well it shows that you know you are getting thick, solid utensils that will be able to take a beating. If you are going to invest in a new addition to your barbeque armoury, you don't want something flimsy that'll last only a year or two. You want tools that'll still be around to pass down to your grandkids! 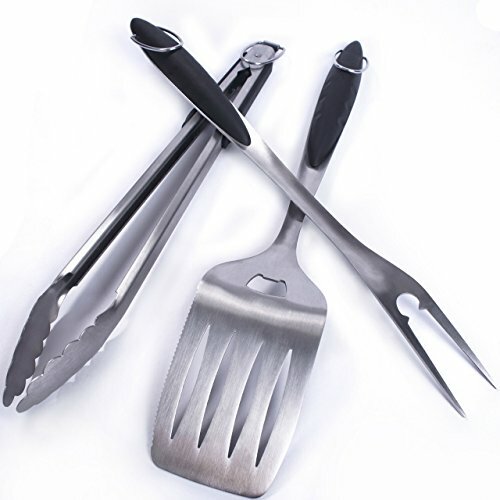 Each tool has been specifically designed for ease of use and comfort at the grill. Ergonomic, contoured grips and exquisite balance will make them feel like an extension of your arm. With these at you disposal you'll be flipping, skewering and shuffling your meat around like grill like a true Grilling Ninja! The market is filled with 8-piece, 16-piece, 21-piece tool sets at rock bottom prices. Sounds great until you realise quality is always being traded for quantity. Crazy thing is you will probably hardly use any of these extra utensils! That's why we focus only on the big 4 - tongs, fork and spatula - making the best possible version of each one that we can. Our fork and spatula are each made of a single piece of thick stainless steel. The turner is extra large to allow you to flip huge steaks and burgers. The leading edge tapers thin for easy sliding under food and has a super sharp cutting edge on the side. The tongs can be locked closed and have a scalloped ends to avoid tearing delicate food. Finally, each tool comes with a huge hanging loop for easy storage. Click Add To Cart at the top of the page now to get your set! BBQ TOOLS OF EPIC PROPORTIONS. Extra thick. Solid stainless steel. You'll be amazed how sturdy each tool feels in your hand. Easily skewer, grab or flip whole chickens, racks and briskets. Never worry about your tools bending, breaking or rusting again. Huge reach lets you get right to the back of the grill without singing your arms. With these trusty utensils at your side get ready to make short work of even the most fully loaded grill, and get back to the party! EXCEPTIONAL QUALITY. ELEGANT DESIGN. As soon you remove the tools from the gift box quality packaging, you'll immediately notice the perfect heft and comfortable contoured rubber grips. 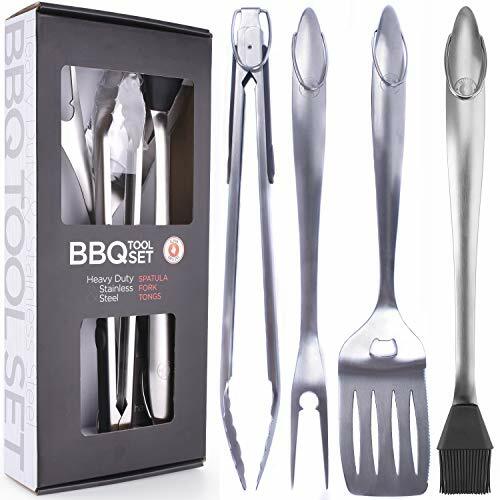 The fork and spatula are each made of a single piece of beautifully brushed stainless steel, while the tongs consist of 2 pieces joined together at a spring loaded hinge. With these tools you will not only own the grill, but also look good doing it! EVERYTHING YOU NEED. NOTHING YOU DON'T. Huge hanging loops and tongs that lock shut to save you space and hassle. Massive spatula head for flipping even the biggest burgers. Serrated cutting edge equal to any steak knife for slicing open your meat or scraping it away from a sticky grate. 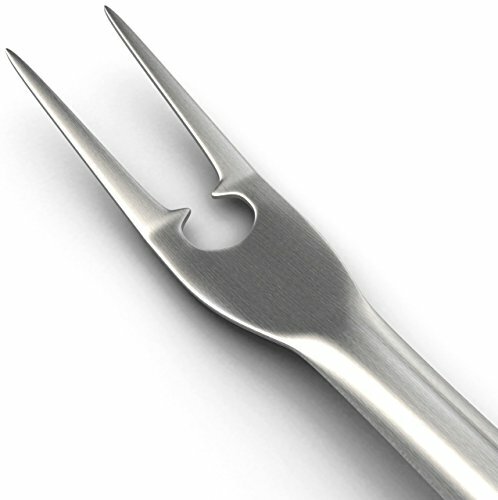 Super sharp fork tines for skewering. Scalloped tongs to allow handling of delicate foods, like fish, without tearing. Even a bottle opened to make sure the Grill Master is always hydrated! PERFECT FOR ALL GRILLS AND KITCHEN. Large or small. gas, charcoal, infra red, electric or rotisserie. Cast iron, steel or ceramic. These utensils work on them all! They are even great for indoor kitchen use, particularly the tongs. They are a perfect accessory for cooking, baking or making salads. This set is also great for camping outdoors. When you are done, chuck them in the dishwasher and they'll be good as new! LIFETIME MONEY BACK GUARANTEE. We are so confident you will love these barbecue accessories that every purchase comes with a lifetime bulletproof guarantee. Any issue at all, just let us know and we'll fully refund your order. You won't find this level of service with the big brands like Weber, Char Broil and Cuisinart.